I’m also thinking about doing some crowd funding so The Cake Farmer can grow and get a new van (fingers crossed). And maybe even find an acre around the Johns Island area for myself. I’m currently about to break ground on two friends’ lots but the lots are about 20 miles away from one another… there could be worse things, so I feel blessed. One lot is on Johns Island and my farm co-apprentice, Stephen, is going to help me figure this whole farming the lowcountry during the summer thing. Woo hoo! The other lot is downtown near a cute park and should be ready once the rain subsides. Less than 30 days to Spring!!! And I am SO ready for spring. Its been miserable the last few weeks here in Charleston… yep, I am complaining about cold weather and rain. But we have been fortunate enough to miss out on blizzards and ice so I really shouldn’t be complaining. I’m just not a winter person. Hey! Hey! Welcome to my new (finally!) website! 🙂 It is still a work in progress, so please bear with me. Thank you. 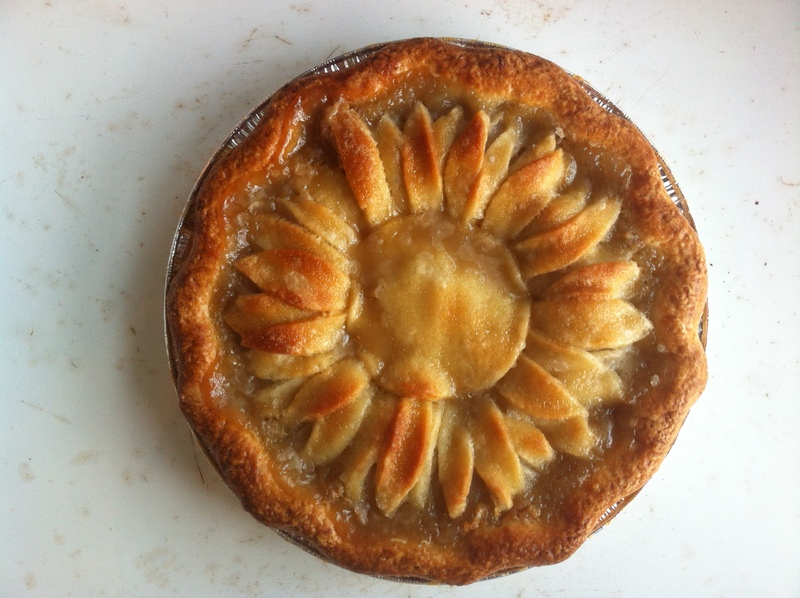 Today’s pie was Salty Caramel Apple! The apples were Granny Smith’s from Niven’s Farm in Moore, SC. The pastry was made with a combination of Leaf Lard from Righteous Ranch, Anson Mills Organic Pastry Flour, Lowland Farms Eggs, and Bulls Bay Saltworks Flake Sea Salt. The caramel was made with Kennerty Farms Honey and The Green Grocer‘s Raw Organic Cow’s Milk – amazing!